Darien's Alex Ostberg (center) and Armstrong Noonan (right) pose after the two-mile run. Both runners earned All-New England honors. 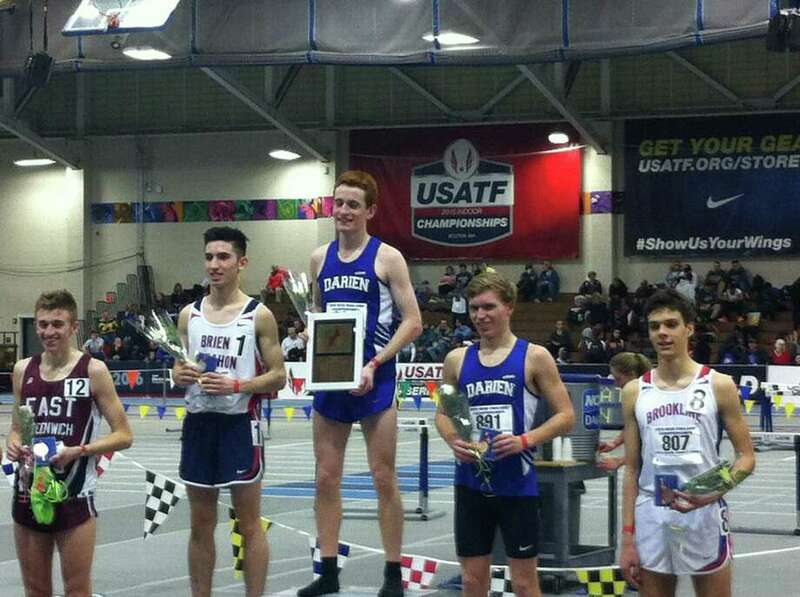 Alex Ostberg and Armstrong Noonan earned All-New England honors for Darien as the team competed at the New England Championships last Friday. Ostberg took home the crown in the two mile with a time of 9:00.58. The time is a DHS and FCIAC record, breaking the mark of 9:02.74 that Ostberg set last year at this meet. "Alex used a fast first 1600 meters of the race to his advantage. He was able to begin pulling away from the field with about 1200 or so to go," Darien coach Tyson Kaczmarek said. "Given his training to this point, the time is a huge bonus. We are focusing on outdoor and he is ahead of where he was indoors last year--very exciting." Noonan also clocked in a very fast time of 9:09.15, a personal best for the junior. Noonan's time was good enough for third place overall. "Army is an incredibly tough runner. This was a huge personal best run for him in an event that he is still learning how to run. His upside is still tremendous. We have not seen his best race yet this winter. Plenty more to come; very proud of him," Kaczmarek said. The times of the two runners rank No.1 and No. 7 in the country respectively. This is also Ostberg's fifth All-New England honor and Noonan's fourth. "Now is when we want to be running fast. We have not backed off our training yet. Nationals is still two weeks away. We will be ready for that meet, believe that," Kaczmarek said. Also competing in the meet was the 4 x 800 team of Arthur Cassidy, Carter Ashcraft, Jason Flynn and James Fay. The team placed 13th with a time of 8:19.58. "That relay team got some valuable big meet experience. That will pay dividends down the road for sure."